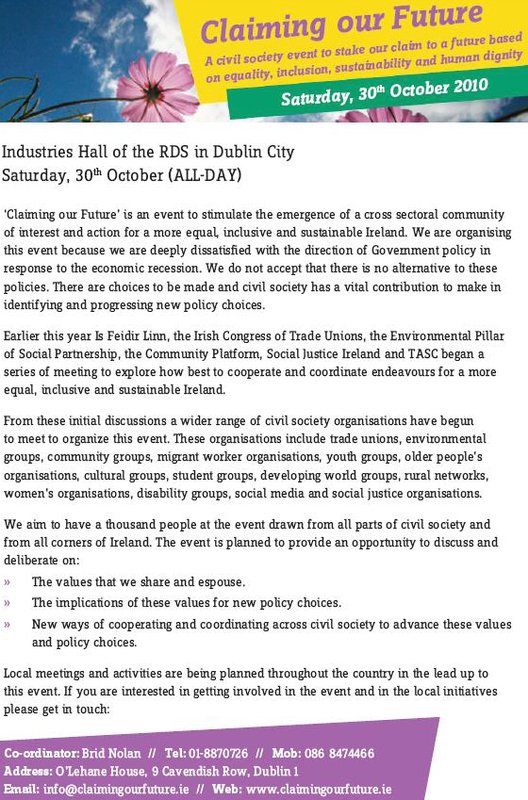 A flyer for the Claiming Our Future event on the 30th of October 2010 in the RDS. Their website is claimingourfuture.ie where a host of documents are available. That name “Is Feidir Linn” immediately reminded me of Niall Crowley and his fantastic book “Empty Promises” telling us where we are at as a society. Anything that Niall Crowley is involved in has to be good and I fully support you. I am attending a VTOS course in Enniscorthy, Co Wexford having been made redundant in 2008. Finances are limited but if I can be of assistance please let me know. Niall Crowley for “President”.